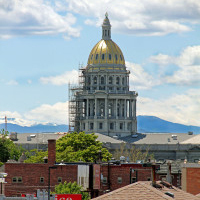 Did you know the dome of the Colorado Capitol Building is gold? Well actually it is gold plate. According to Wikipedia, the structure was constructed in the 1890’s from Colorado white granite and its distinctive gold dome consists of real gold plate. You can imagine the corrosive nature of pigeon droppings on such a fine, precious metal. Pigeon poop is unsightly, can smell bad in large amounts, and can attract insects. This is a story about pigeon birth control, a sweet little old lady, and doing what it takes to get the job done. 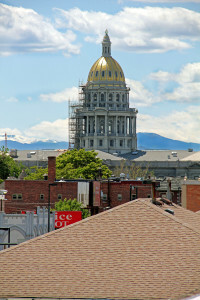 Many years ago, the State of Colorado hired Tom to eliminate the pigeons at the Colorado Capitol Building. This was long before 9/11 and security measures were not quite what they are now. At that time, visitors could hike up and up the spiral stairs into the dome, stepping outside to enjoy a vast, spectacular view of the surrounding buildings, and beyond to the distant Rocky Mountains. It is a stunning panorama. A good pest control operator must determine pigeon nesting areas before effectively treating a pigeon problem. That was exactly what Tom was doing for several days in a row as he endured the steep, winding assent to the top of the dome. With binoculars in hand he always took a moment to admire the breathtaking view from the top before he patiently began observing the roosting pigeons and watched their flight patterns. This job proved to be pretty tricky, and he found he was having some difficulty locating the nests. One day, the security guard approached Tom, with a stern inquiry, “Hey buddy! What the heck are you doing with the binoculars?” The guy was suspicious of Tom’s behavior and definitely imposing his authority, poised for action. Quickly Tom produced his Company ID and explained that he was a State contractor, simply trying to help take care of the pigeon problem. After further explanations, the guard relaxed and wanted to know more about this interesting process. Putting two and two together, the guard had a brilliant idea. He told Tom about a woman who sat everyday on a bench in the park area down below, gently and lovingly feeding her dear pigeons. Once again, Tom got the job done, made a couple of new friends, and solved this major problems for our beloved State of Colorado. For information on Pigeon Pest Control, please contact Colorado Pest Management at 303-706-9616. Thank you!